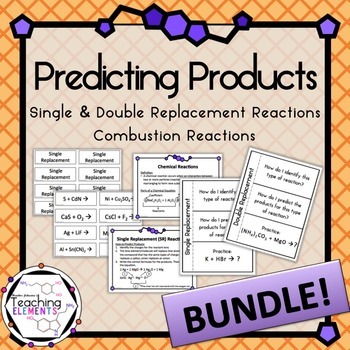 Use the Editable PowerPoint to discuss how to predict products for single replacement, double replacement, and combustion reactions. Students can write on the interactive notebook pages to keep track of this information. Then use the reaction cards to sort into types of reactions, predict products, and balance equations! There are 21 practice problems total (7 for each type of reaction). Category cards are also included so that you can make this assignment into a matching activity as well! Want more practice? Check out Predicting Products Puzzle Activity!